Computer education is very important in these days. With proper training in computers, the chances of getting a good job double. But the rural areas still do not have access to proper training facilities. With this aim, the UP state authority launched a unique scheme named Uttar Pradesh Free “O” Level Computer Training. Under this program, selected applicants will receive formal training in basic computer operation. They will get certificates for attaining o level basic training in computers. Empowering youth of UP – The implementation of this scheme will assist UP state government in reaching out to eligible candidates and provide them with computer literacy. It will not only enhance education system but will also widen opportunity scope for candidates. 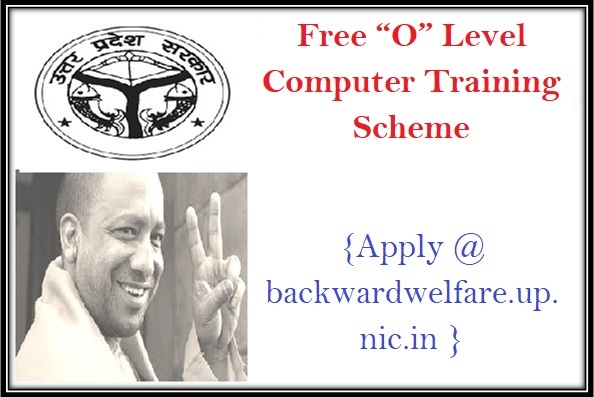 Basic computer coaching – As per the guidelines of the scheme, UP state will provide computer training to the selected candidates. They will get training for mastering “O” level of basic computer coaching. Free coaching for candidates – It will be the responsibility of UP government to provide eligible candidates with proper computer training without charging any fee. It will assist the candidates of poor and backward categories. Tenure of the course – According to the scheme draft, the O level training for selected candidates will last for one year only. They will get training to operate computers. Certificates will be given – After the completion of this computer training, each candidate will also receive a certificate. It will assist them in bagging a good job. Contribution of state – Training so many candidates is not a mean task. The state government will provide Rs. 1000 for each candidate so that they get this basic O level training. Money to be transferred in account – The state will refund the admission fee into the bank account of each candidate. Once the candidate has received an admission receipt from computer coaching center, the state will transfer the funds. Area under its coverage – For the time being, computer training institutes have been opened in 102 village panchayat areas. Soon, more training centers will be opened. People providing the training – People who want to get associated with Prime Minister’s village literacy assignment, will receive required training from CSC institutes. Each panchayat will get 250 trained persons. Training by DOEACC – DOEACC is the main department that imparts computer training in government institutes. UP government has also given the responsibility to the DOEACC to conduct this program. Resident of Uttar Pradesh – only the candidates, who are legal residents of Uttar Pradesh, will get the opportunity to enroll under the educational scheme. Must have passed 12th standard – To get the benefits of this scheme, each applicant will have to prove that they have at least completed formal education till class 12. If they do not have this qualification, the application will be rejected. Must be of certain age – It has been highlighted in the draft of the scheme that individuals who fall in the age group of 18 to 35 years of age will get the opportunity to apply for this free computer coaching. Must belong to BPL category – If the applicant is desirous of getting access to free computer coaching, it is mandatory that he or she belongs to below poverty level category and has adequate documentation. Must be of backward class – The implementation of this program has been done to assist candidates of backward castes or classes to get better opportunities. Thus, each applicant must belong to backward castes. Must have low income group – If the yearly income of the parents of any applicant is more than 1 lakh, then he/she will not be allowed to get the benefits of this free computer training. Should not get any other scholarship – In case the applicant is already enrolled under any other state or central government welfare plan, he or she will be barred from getting this free computer training. Should not be employed – It has been highlighted in the draft of the welfare program that an interested candidate must not have a job that gives them a steady income. The person must be jobless while applying for the program. Applicants domicile certificate – The welfare scheme is launched for the people who live in Uttar Pradesh. So, if any candidate desires to get the benefit of free computer raining, he/she must possess domicile certificates. Applicants’ age certificate – As there is an age related criterion; all candidates must furnish such documents, which will support the claims of age. The birth certificate, Aadhar card or 10th standard admit card will be accepted. Applicants academic certificates – There is an academic criterion as well. Thus, it is mandatory that each candidate must provide the pass certificate of 12th It is the academic cut off. Income certificate of the family – There is an income related criterion as well. The candidates, who have an annual family income of Rs. 1 lakh or less, will be permitted to apply. Thus, producing the income certificate is a must. Aadhar card of the applicant – As per the mandate of the central government, production of the Aadhar code is a must. Every applicant will have to attach a photocopy of his or her Aadhar document for confirmation of identity and other details. Ration card and BPL card – The scheme is launched for assisting candidates who are poor and needy. Thus, each candidate must produce photocopy of their BPL card and ration card to highlight that they belong to backward classes. Caste certificate – Candidates of ST, SC and OBC category will be served by this scheme. So, each applicant must attach a caste certificate with the registration form. For the time being, the submission of the forms will be done by offline procedure. But interested applicants will get the registration form from the authorized website of the respective department. By clicking on the link http://backwardwelfare.up.nic.in/Form.htm, you will reach the webpage of Backward Welfare Department of Uttar Pradesh. It has already been mentioned that each candidate will have to restore to offline methods to submit the application. Once the candidate has logged on to the authorized webpage, he/she will get the PDF format of the application form by clicking the appropriate links. The official link of the site is http://backwardwelfare.up.nic.in/Form.htm. When the candidate clicks on the highlighted link, the digitized form will open in the same tab. Once the site gives access to the PDF, each candidate will have to download it and then get a clear print out of the form. After getting the form, candidates will have to fill it up with the personal and academic details. Care must be taken to ensure that all details are correct. The selection of the applicant will be finalized once all verifications yield positive results. To assist respective authority in checking the validity of the data, each application form has to be backed by various papers. Once this is done, the candidates will need to take the form to the respective office of District Backward Class Welfare Department. Here, the officers will accept the forms and provide a receipt to the applicants. With successful operation of this educational and welfare scheme, the state government of Uttar Pradesh will be able to provide better opportunities for rural and backward candidates to get accustomed with the use of computer. With better computer literacy, the chances of bagging a better job will increase. It will also back PM’s dream of Digital India. The government has commenced online ‘O’ level and CCC Computer Training Scheme from the on-going fiscal year, targeted towards the jobless youth that fall under the category of backward class. Anil Sagar, the director of Backward Classes Welfare Department provided this information. He said that the applications for rendering the ‘O’ level and CCC Computer training to the underemployed youngsters, who belong to the backward classes of society, can be affirmed online from 5th June to 14th June 2018 by the institutions functioning in districts and are sanctioned by Government of India accredited NIELIT.